Sprint Sand & Clay provides a variety materials from our many mines including: quality sand, topsoil, fill dirt, select fill, mulch and other construction and landscape materials. .
Sprint Sand & Clay delivers full-service construction material with trucking, excavation, demolition building pad and other construction service capabilities. We take pride in our quality people and our quality work. from residential to commercial, browse through our projects and see the difference Sprint makes for yourself. Quality products are a must, but it's people that make the difference at Sprint Sand & Clay. Learn more about the management, service and sales teams that make us the number one choice for sand and clay materials and services for over 30 years. 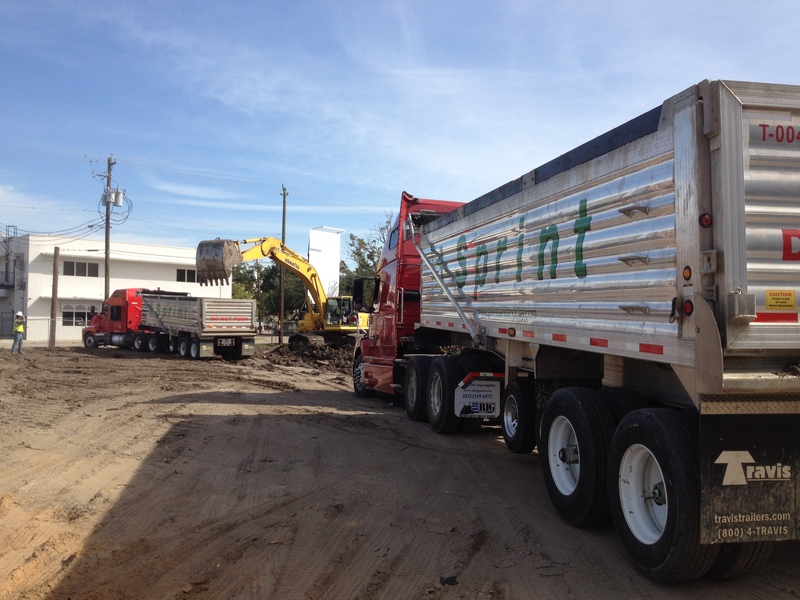 Trucking and Logistics: With a network of over 200 tandem dump trucks and 75 high yield dirt trailers, Sprint Sand and Clay has the trucking resources to make your next dirt project a success. Whether you are excavating and removing dirt from a detention pond or building foundation or your project requires the importation of select fill, bank sand or other fill materials, our broad base of fully insured truckers allows us to meet the demand of your project schedule. Residential Construction Services: With over 20 active mining locations, Sprint Sand and Clay is the leading supplier of select fill, rough grade, form, and final grade sand to the homebuilders of the the Greater Houston Area. From custom home builders to large scale homebuilders in master planned communities, Sprint provides the convenience of being able to call one company to provide you with the products you need no matter where you are building. Furthermore, we have the technology in place to accurately book orders to match your P.O system requirements. We know that your time is valuable, so our our Central Dispatch team works diligently to take your order in a timely fashion, provide quick and accurate pricing, and honest feedback on delivery schedule. And once your order is placed our Operations Team will work hard to make sure a quality product is delivered on time, at the right location. Commercial Construction Services: Your Commercial Construction projects require a reliable supplier who can provide the proper materials on time and within your budget. Sprint Sand and Clay is currently the largest supplier of sand and clay products in the Greater Houston Area, and prides itself on having the resources to handle any kind of application. We understand that production, price point and quality of product are just a few of the variables associated with managing a successful project. With over 20 active mining locations, unlimited loading capacity and access to a trucking network comprised of over 200 tandem dump trucks and 75 high yield dirt trailers Sprint is ready and willing to be your material supplier. Detention Pond Excavation: Sprint continually explores ways of integrating a wide range of services that complement our core business of marketing fill dirt and bank sand materials. One example of this is our ability to provide turn key detention pond excavation services to land developers, municipalites, and drainage districts in the Greater Houston Area. Our network of over 20 dirt disposal sites, coupled with our ability to market fill and sand materials directly from detention pond excavation projects allows us to provide cost effective solutions for creating the storm water detention required on many projects.